In this week's review of Yusho, the new yakitori joint from ex-Trotter's chef Matthias Merges, I couldn't spill enough ink on barkeep Alex Bachman, whose evolving cocktail program promises to fill a void in Logan Square/Avondale when Paul McGee leaves the Whistler next week. Bachman grew up on the Gold Coast, and landed his first restaurant job as a runner during Merges's tenure at Charlie Trotter's, beginning in 2003. After five years he'd worked his way up to assistant sommelier before he left and spent six month working under Christopher Donovan at the House of Glunz. It was there that he began to immerse himself in the study of artisanal spirits. "There was a lot to learn from," he says. "He has stuff in the inventory going back to 1880." To Bachman there's no difference in the appreciation for wine, spirits, and beer. "It's all beverage to me," he says. "It's one in the same the way people taste wine and cocktails—they're looking for balance in acidity, dryness vs. sweetness, etc." There's been some beautiful documentation of Bachman's work so far over on LTHForum, and Serious Eats posted a few recipes earlier this week. But I was really interested in a manhattan currently on the menu called the Three Arrows, made with the relatively young Whippersnapper whiskey (from Tad Seestedt, the Oregon vintner and distiller responsible for Ransom Gin), and Barolo Chinato, a quinine-infused digestivo made from what is arguably Italy's greatest wine. A few dashes of fenugreek bitters add an element that is unmistakably Indian. 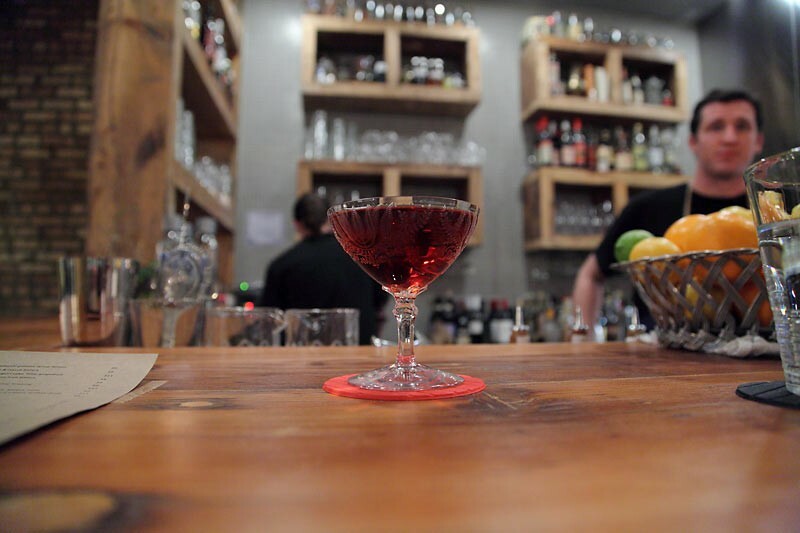 It's one of the best manhattans I've ever had the pleasure to sip, fruity and full bodied, with a bone-dry finish. But take it from Bachman: "One of the things that attract me is the very youthful whiskey, which isn't driven by barrel character. It speaks to the grain, orchard fruit, and subtle spice. It leads with this amazing red fruit character, adding depth and complexity. 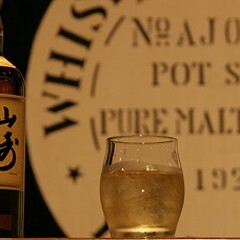 When it comes into play with a youthful whiskey it's like breakfast cereal with dried cranberries. 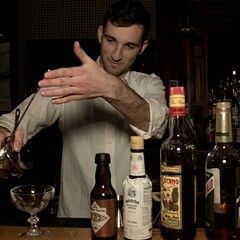 "As in all cocktails, dilution is key, but with this guy you're really looking to do a long stir. Water from the ice helps the yield of the cocktail and it really marries the Chinato and the whiskey and creates some integrity and uniformity." Pour over ice into a pint glass and give it a good 45-50 seconds of stir time. Strain and add a few cherries. *There are no commercially available fenugreek bitters, but Bachman says they're relatively easy to make. The horse chestnut and quassia bark aren't mandatory, but you can order them from Mountain Rose Herbs. Macerate everything for ten days in a large two-liter glass container. Strain out, reserve liquid, discard solids. You can add water to acquire desired proof and aromatics (though we leave it as is).